Today Ubisoft released details about the much anticipated Assassin's Creed II that is being developed by Ubisoft Montreal. The game is scheduled for release during the 2009 Holiday season across all current-gen platforms. Assassin's Creed II takes place in 15th Century Italy during the Renaissance period. 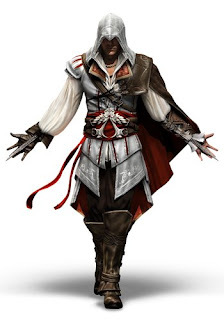 This time around, you play as Ezio who's been betrayed by rival ruling families of Italy. Being a huge fan of the original Assassin's Creed, I have high expectations for part deux. With the first, Ubisoft Montreal really pushed innovation in creating a game with vast and richly detailed environments that were highly interactive. Crowd and enemy AI that demonstrated realistic reactive properties. A combat system that introduced fantastic countering mechanics and an addictive stealth assassination feature. Let's hope this next iteration replicates what the first did and builds upon it. For more details on the game, you can read about it in the latest edition of Game Informer magazine or this weekend in Sun Media newspapers across Canada or online at wham.canoe.ca. To view the teaser trailer, check out our YouTube channel. You can also visit the offical game site at www.assassinscreed.com.